Enjoy the best of South Australia with this fantastic cruise and land package from Captain Cook Cruises. Enjoy three or four nights cruising the spectacular Murray River aboard its only paddlewheeler, the Murray Princess, one night in Adelaide and two full days on Kangaroo Island. Passengers will spend the first part of their trip cruising the beautiful Murray River and exploring the big river gorges, bio-diverse Murray riverlands, unique flora and fauna of the outback and experiencing exciting day trips to historic ports, sacred Aboriginal sites, a sheep station and woolshed and a native wildlife shelter. On-board passengers will enjoy outside cabin accommodation, all meals, the use of two spas, two saunas, a sun deck, two bars, two lounges, a single sitting dining saloon and great entertainment. Following the cruise, a complimentary scenic coach will transfer passengers to the Mercure Grosvenor Hotel in Adelaide. Arriving at midday guests will enjoy one night's accommodation and have all of Adelaide's main tourist attractions including Rundle Mall, Skycity Casino, museums and art galleries at their feet. A coach will then transfer guests the next morning to Cape Jervis where they will join the Sealink Ferry to Kangaroo Island. Day one on Kangaroo Island will feature a full day Seal Bay Discovery Tour including a delicious lunch. Guests will then settle into their choice of overnight accommodation on the island. On day two, guests will enjoy a Remarkably Wild tour that also includes lunch before returning to Penneshaw for the return ferry and coach to Adelaide. For a few dollars more guests can upgrade to the late afternoon flight from Kangaroo Island to Adelaide. 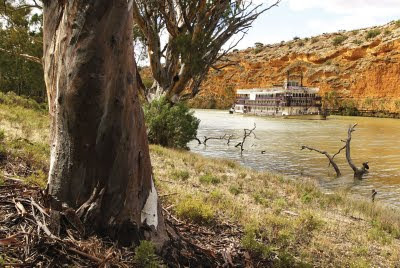 For people with a love of food and wine, an optional full day Barossa Valley Tour is available when disembarking the Murray Princess at Mannum. Those on the tour will return to Adelaide at 5.30pm that day in time for the transfers the following morning to Kangaroo Island. Prices for the five night package starts from $1604 per person, twin share and includes three nights on the Murray Princess, one night at the Mercure Grosvenor Hotel and one night on Kangaroo Island. The six night package starts at only $1874 per person, twin share and includes four nights on the Murray Princess, one night at the Mercure Grosvenor Hotel and one night on Kangaroo Island. Prices are valid to 31 March 2012. For further information and bookings, please contact Captain Cook Cruises toll free on 1800 804 843; Int +61-2-9206-1111, Email: murray@captaincook.com.au or visit www.captaincook.com.au.